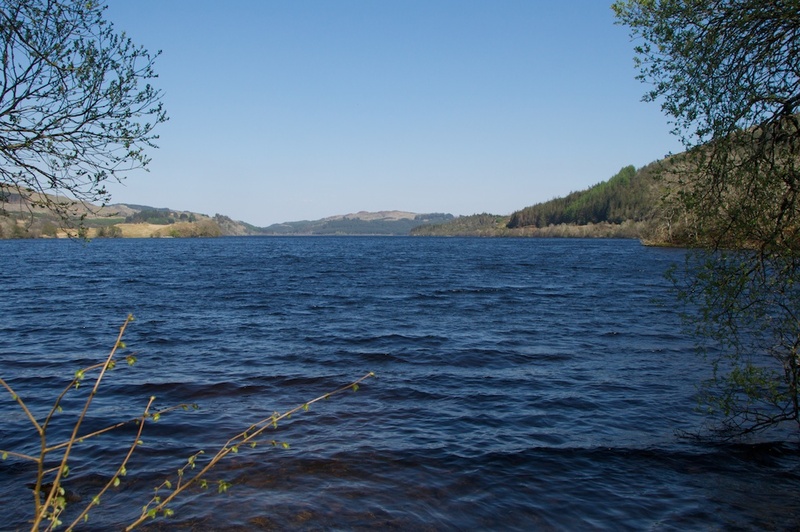 We were driving along the minor road that winds its way up into the hills above Kilmelford and then drops down towards Dalavich on Loch Awe. Blue sky, warm sunshine, cherry blossom, a cuckoo on a fence, and a couple of hundred potholes in the road. Progress was slow. 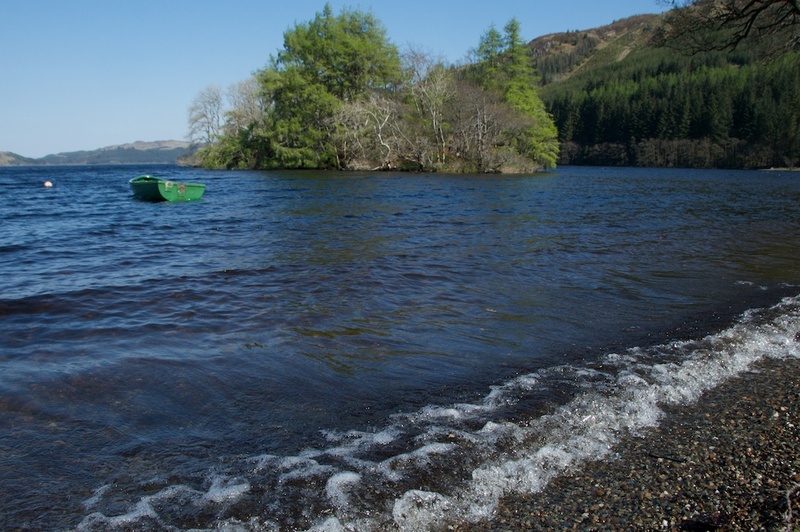 I wanted to take a look at Loch Avich, a five-mile stretch of water that somehow manages to conceal itself from most visitors to Argyll, largely because of its remote position; if you’re a fisherman, however, you probably know it well. I’d read a lovely old story about a castle, several moons ago, and I couldn’t even tell you now where I first found it. But it was simple and sad, in the way that ancient Scottish stories so often are. 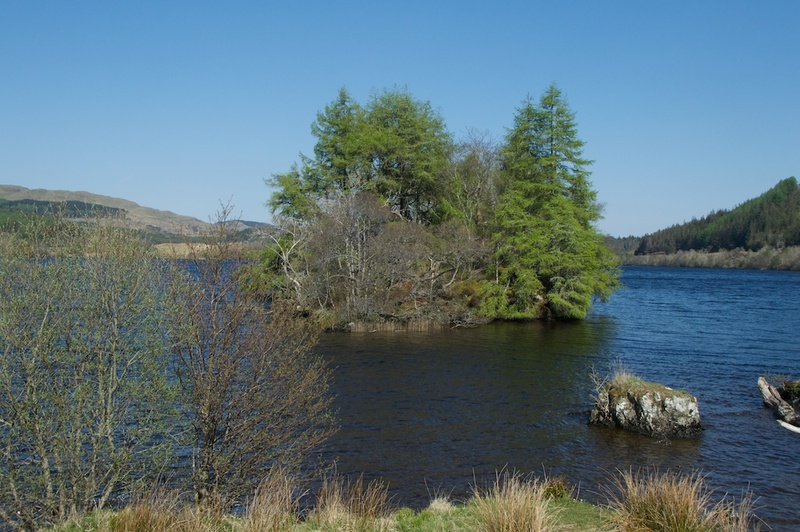 On a tiny island in the loch, known as Innis Luana, are the ruins of a castle known as Caisteal na Nighinn Ruaidhe – ‘the castle of the red-haired maid’. We don’t even know the name of the red-haired girl. That’s the thing about history, from this kind of era anyway – it was written largely by men, for whom women were often bargaining tools in the quest for power. In ‘A History of the Clan Campbell‘, Alastair Campbell lists Caisteal na Nighinn Ruaidhe as one of a handful of fortresses that can be dated back to the earliest of Scotland’s stone castles, built between 1200 and 1250. He reveals that a woodman named John Dewar, who collected tales in the mid-19th century, believed that the castle was built by the MacFiachars, who claimed descent from Niall of the Nine Hostages, an ancient Irish king. But then, at some stage, the castle came to be owned by a family named MacCaurre. Just how this transfer from MacFiachar to MacCaurre came about seems to be a bit of a grey area, and I’m not going to attempt to sort it out. It may even be a mutation of the same name. If anyone can shed any light on it, I’d be glad to hear from you! It should be said that the writer of the article from which this extract is taken (Tony Dalton) gives his opinion that the ‘old tower and fortalice’ referred to was not, in fact, Caisteal na Nighinn Ruaidhe but the dun or fortress at nearby Duninveran, as he considers the late 12th century to be too early for the building of the castle; looking at the archaeological remains, and comparing them with similar sites, he proposes that Caisteal na Nighinn Ruaidhe* was built by Sir Colin Campbell shortly after 1316. But this is not to say that there wasn’t an earlier hall-house on the island, whose traces have since disappeared. *I believe that the name is pronounced roughly ‘castyel na nee-an roy-ah’. So was the red-haired girl a real person, or an apparition – or did the fate of one lead to the other? It was originally a three-storey oblong tower house with walls seven feet thick, surrounded by a defensive wall with a small outbuilding. Most of it has now fallen to rubble, apart from the south wall of the tower house. 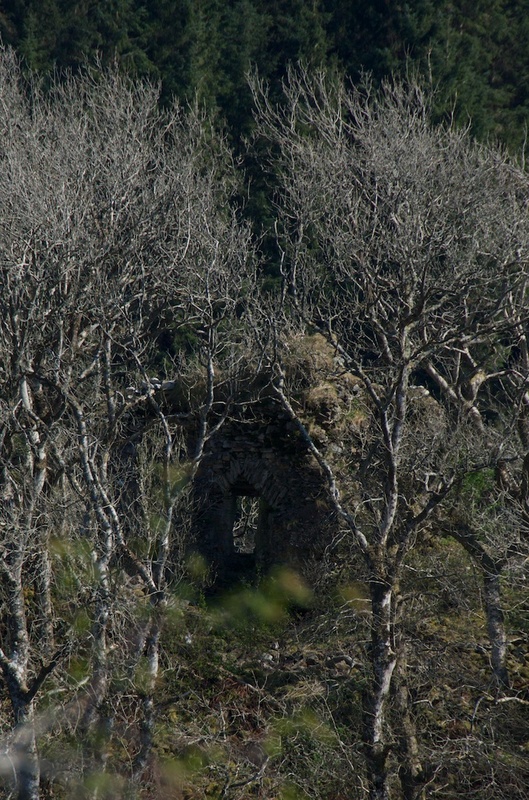 Viewed from the shore, it’s almost completely obscured by trees, but through the branches an arch and a window can just be seen. Back to Mr Campbell again, who says that Dugal MacCaurre’s son, also Dugal or Dougall, married “a daughter of MacSween of Skipness, son of Sween the Red who built Castle Sween”. So it sounds as if we have some red-haired genes, at any rate. But we still don’t really know when the castle actually got its name. And the red-haired maid is still anonymous. Then I find that this little island is mentioned in an Ossianic poem, which was translated by John Smith of Campbeltown in ‘Galic Antiquities: Consisting of a History of the Druids, particularly of those of Caledonia’, published in 1780. For three days the heroes feasted at Innisluina as the honoured guests of Moran; and on the fourth day they went hunting. Annir followed them, possibly to admire Gaul’s skill in the chase, but she was haunted by fear and wished that Garno would leave the land. Annir, who has been secretly watching the confrontation all the time, quietly withdraws in despair. But she has heard Garno say that he would yield to no one but Gaul; and it is to Gaul’s side that she then hastens her steps. The youth’s reply is enough to send shivers down your spine, even now. Trying to appear unperturbed, Gaul gathers his own weapons and hums a careless tune. But he clothes himself with his arms “like a ghost that clothes his dark limbs with meteors of light, when the mountain-heads are shaking in thunder.” From the shadows Annir watches, unseen. Accordingly, when darkness fell, Garno and Gaul went to the appointed hillside; each, unknown to the other, was expecting to fight Duaran to the death, “for night was dark on the hills, and this oak concealed the sky.” They engaged in battle, unaware that friend was fighting friend. The duel lasted all night, but in the light of sunrise, as Gaul and Garno lay dying of their wounds, each finally recognised the other. The last words they exchanged were of deepest sorrow. Annir was the first to discover their bodies, and she sank to her knees beside Gaul with a cry of unbearable grief. She would not be parted from her love; and the next day she, too, lay dead. For two days afterwards Annir’s father, Moran, grieved within his castle walls, and then he asked for his staff and left his fortress forever. 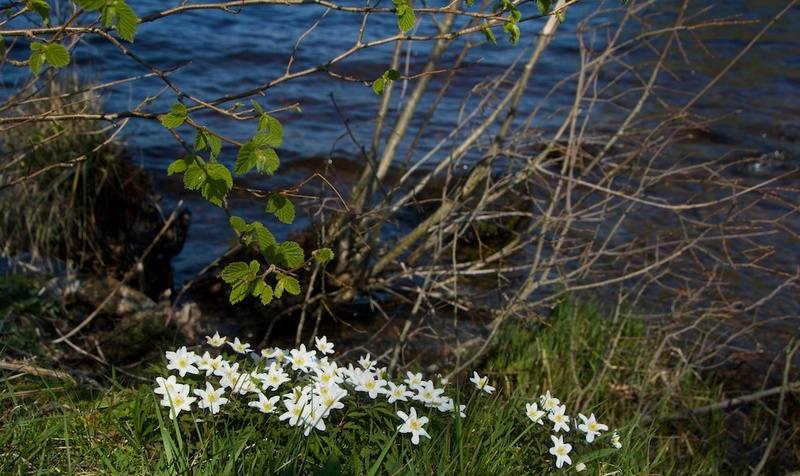 Hazel trees grow on the shore of Loch Avich, and beneath them a patch of wood anemones had opened wide in the afternoon sun. These flowers are usually pure white, but curiously a couple of them were flushed with pink. A lovely echo, perhaps, of the blood of the two heroes staining the waters of the ‘passing rill’. And meanwhile the Castle of the Red-haired Girl remains largely hidden from prying eyes, and even if we’d bought a fishing licence and hired a boat I’m not entirely sure I would have gone and trampled all over the memories. Some places seem to exist only partly in this world, and they are best left to their own dreams. A note about the Ossianic poems: In the mid and late 1700s a writer from Inverness named James Macpherson published a wealth of poetry which he said he’d translated from the works of a third-century bard named Ossian, who is a figure in Irish legend. Macpherson claimed that the original verses had been collected from people he’d met during his travels in the Highlands. Some contemporary historians were immediately suspicious, seeing anachronisms in the language, and today the general opinion seems to be that the works were largely the product of Macpherson’s fertile imagination. They are strangely spellbinding, though, drawing you in like the tales in the Mabinogion, with their characters that look human but can harness the wind and split rocks to make thunder. And, like the legends of Arthur and so many others, they have underlying morals that would have spoken clearly to medieval ears, had they chanced to hear them. The collection of works I have quoted from was compiled by John Smith, a minister at Campbeltown; his offering is described by one source as ‘a powerful auxiliary to the cause of Macpherson’. It was obviously in the same tradition. Maybe we’ll never know their real provenance. For myself, I must say that I love these old texts, because I don’t mind following strands of thought, even if they lead you all around the hills. I love the halls and hunting dogs and the ‘branchy deer’. There’s a peculiar joy in the telling that lingers over every detail and strays all over the place before it gets to the point, because story-telling was such an old and important tradition, and some tales took several days to tell. And most of all, I am grateful to John Smith for giving me a name for the red-haired girl. As always, impeccably researched and beautifully described and illustrated. Thank you, Jessica! 🙂 I loved writing about this place. Soooo, tantalizing. I do remember your earlier posts about the Castle of the Red-Haired Girl. 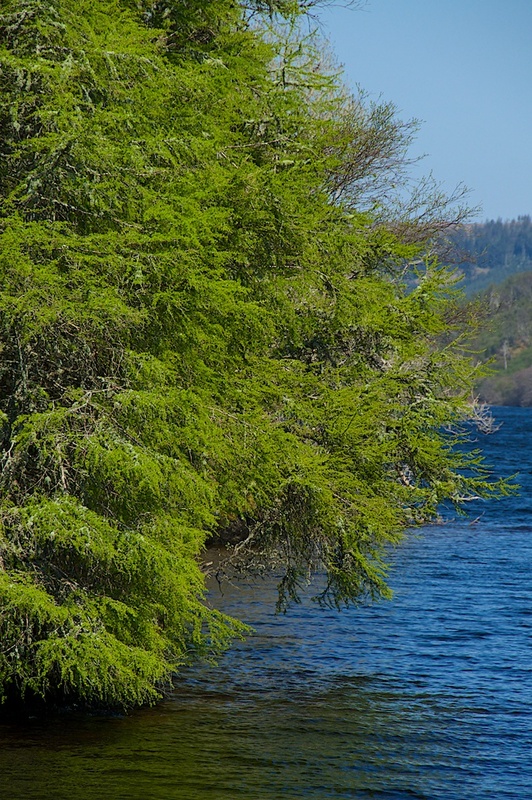 We’ve wandered Loch Awe a bit and now have resolved to return. I saved this until I would have time to savor it. Well done, and thank you. But oh, I was so wanting to go through that door!! Aahh, yes! So alluring! But would you ever return?! 🙂 Thank you very much – really kind! Yes, I guess it would, Lynne! I’m not going to be writing that, though! 🙂 Glad to hear you had such fab weather. 😀 I think you will! It’s a blessing, really! In 2016 we were fishing Loch Avich. My colleague was convinced he heard a banshee-like wailing sound. He doesn’t want to go back there … but at least he’s still alive. Neither of us knew the story of the red-haired maiden at the time. Oh my goodness!! That sounds very weird! I can well imagine how it spooked him. What can I say… the story is there… I’ve always felt there’s an atmosphere about the place, so I’m fascinated to know this! Thanks for telling me about it. For the record. 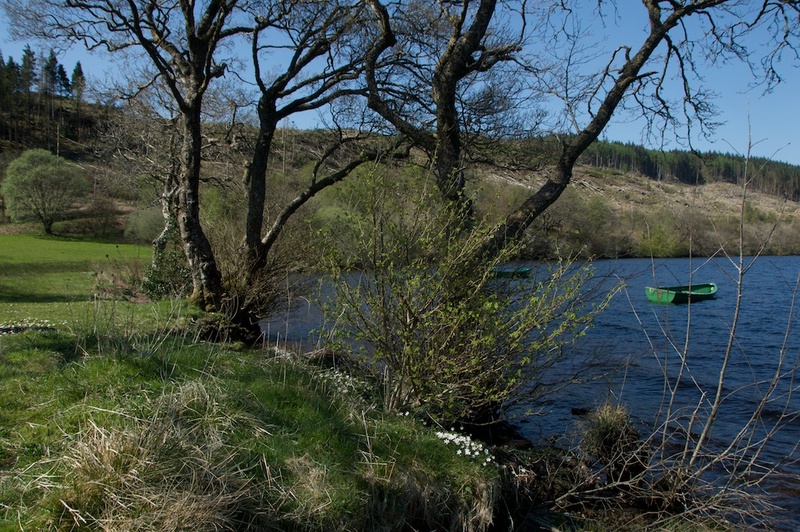 I was the fisherman referred to who was reluctant to return to Loch Avich for reason of having encountered the banshee. There were two of us in a boat that day The weather was fine, the scenery wonderful. We caught very little, nor apparently did the only others we met –a couple in a double kayak. At about mid afternoon a strange sound began and lasted about 3 minutes. I can only describe it as similar to wind in telephone wires–fairly distant, high pitched and from no apparent direction.Similar to faint wailing. We were puzzled but not alarmed and continued to catch nothing. This year responses were requested to the suggestion that the fishing group return to Argyle and my reluctance to go back to Loch Avich was entirely in jest. 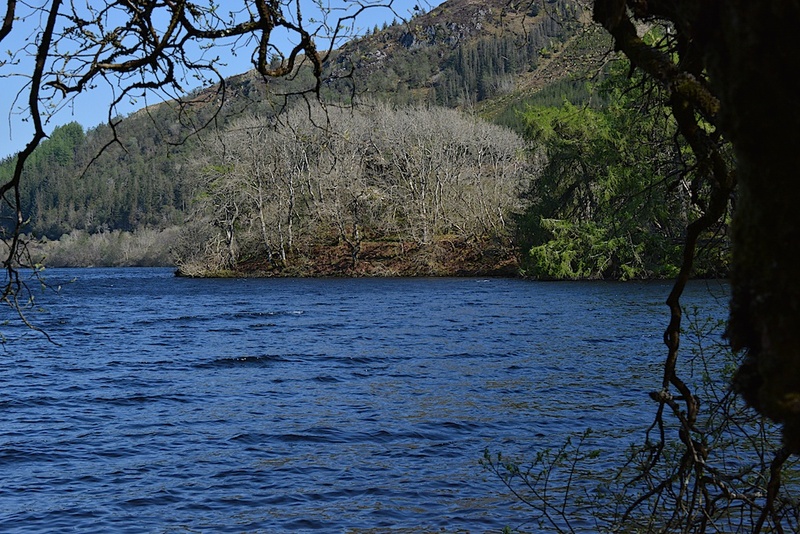 I would hate to dissuade folk from visiting the Loch in that beautiful part of Scotland. Hi Tony, thank you for describing your experience! That is so interesting! I have heard similar sounds in trees, but only in high wind – I can see why your Irish friends thought it must be a banshee. Who knows? I think these experiences are purely personal, and I can imagine how you felt when you found out about the story! I shall certainly be interested to go back there myself now, and I’ll report on any unusual phenomena! I’m pretty sure your experience won’t discourage people. I would love to know if anyone else experiences anything, though! Unsure if my previous comment went. Good site thanks, found purely by chance. I live in Lochavich and if you email me I’ll forward more information on the castle.